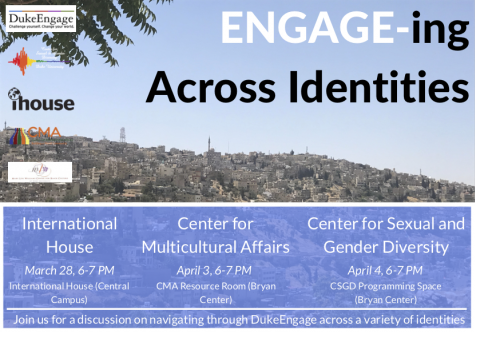 DukeEngage is partnering with identity centers across campus to bring together students who have already done or who will participate in DukeEngage to discuss how our various identities may influence the DukeEngage experience. The events will take place at International House, the Center for Multicultural Affairs and the Center for Sexual and Gender Diversity. We would love to have you join the conversation!